Just wait till you’ve spent 90 solid days enmeshed in His life, walking with Him through triumph and trial, reacting to the very same questions He posed to His first followers. That’s because this is deeper than daily devotional. This is Bible study. This is a plunge into the Word’s picturesque original languages. Yet it’s also an invitation to quietly sit at His side and awaken your spirit, to hear and respond through journaling and prayer. To love Him. Oh, to love Him! 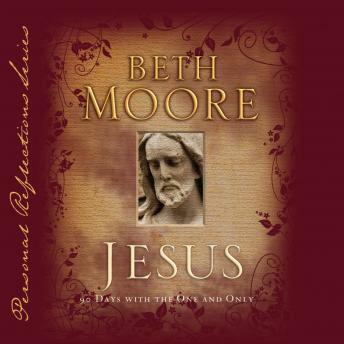 Jesus: 90 Days with the One and Only is everything you’d expect a Beth Moore devotional audio book to be — the perfect blending of your heart, hers,... and His.